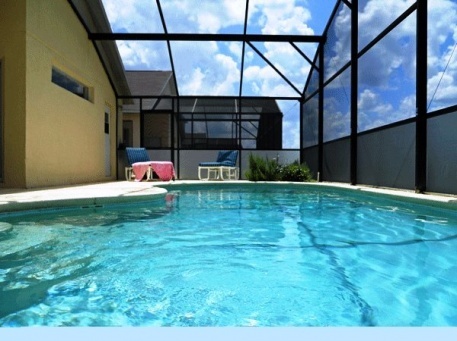 Ideally located in a beautiful gated community, Westridge, close to Disney World, this 4 bedroom, 3 bathroom, Florida villa with private screened swimming pool will sleep up to 10 people - offering the perfect Florida holiday accommodation. Westridge, located on the US27 between Interstate 4 and US192, offers a community clubhouse which contains a well equipped gym for your usage. Other amenities include a community swimming pool behind the clubhouse building, tennis courts, childrens play area, basket ball & volleyball courts, and wireless internet access. These facilities are free for you to use when enjoying a Florida holiday here and well worth a visit. This Florida villa offers an open plan layout. The front door leads to a formal dining area seating 6 to 8 comfortable, and then opens into the family living area. The living area is spacious and well proportioned with plenty of seating and a sofa bed for additional sleeping. The 42″ widescreen HDTV has cable with over 50 channels and there is a DVD player and iPod stereo for a cozy night in after a hectic day at the parks! There is an additional dining area adjacent to the living room right next to the open plan kitchen with adjacent breakfast area. Equipped at a high standard there is a luxury stainless steel fridge freezer with ice maker, and a large stove and microwave. The stainless dishwasher, waste disposal, kettle and coffee machine make life easier. There is plenty of glassware and pots and pans to cook up a real treat should you choose to eat in. The Master Bedroom with King-size bed has a walk-in wardrobe closet with plenty of room for the results of your shopping trips to the many malls in the area. There is an en-suite double shower bathroom which also has access directly to the terrace, giving you your own private access to the pool. The second spacious bedroom has a Queen-size bed with an adjacent en-suite bathroom. The two additional bedrooms each contain 2 twin beds and share the third bathroom which has a bathtub with shower. All bathrooms have fitted vanity units and hairdryers included. Patio doors lead from the lounge to the screened private pool and patio area. The pool is an excellent size for swimming or just relaxing in, and at night is lit via pool light. The pool can also be heated for your comfort. There is plenty of outdoor seating as well to ensure you, your family, and friends can all enjoy the company and atmosphere with each other. Telephone calls to America and Canada are free. There are many superb golf courses within 10 miles including Championsgate with two Greg Norman designed courses, Reunion with three courses designed by Tom Watson, Arnold Palmer, and Jack Nicholas, Highland Reserve, Providence, Southern Dunes, Orange Lake, Diamond Back, and Falcons Fire to name just a few..
Interstate 4 provides easy access to Tampa, Busch Gardens, Sarasota and the white sand beaches of the Gulf Coast, and to Daytona, Cocoa Beach, Kennedy Space Center, and the superb beaches of the Atlantic Coast.